Mr. Kash Ubhi has been placing and restoring dental implants for over 20 years. 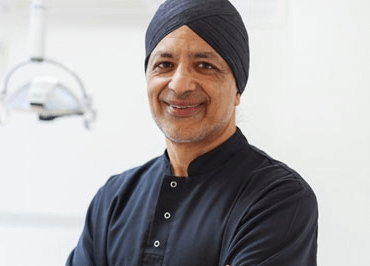 Qualifying from King College, London in 1985, Kash was awarded a Distinction in Master of Science Degree in Implant Dentistry from Guys and St Thomas' Hospital in 2000 and achieved the "Specialist in Prosthodontics" status in 2003. With his continuous commitment to excellence, Kash has lectured extensively in both the UK and abroad. He is often invited to participate in postgraduate teaching both nationally and internationally. He is also an Examiner for the Implant Diploma at the Royal College of Surgeons of Edinburgh, as well as Specialist Dentist in the craniofacial department at the Chelsea & Westminster Hospital. Kash believes in the whole mouth approach to dental care, so that he can tailor treatment from his extensive knowledge of implants, smile makeovers, crowns, bridges and cosmetic dentures to create beautiful, life changing smiles.